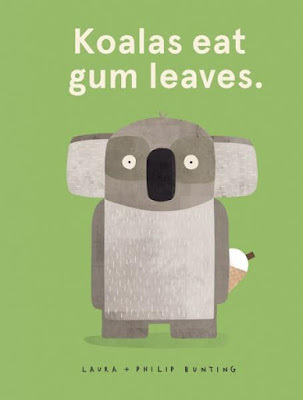 If you had to eat the same thing for breakfast, lunch and dinner every day of the year I think you would begin to feel like the koala in Laura Bunting's first book, Koalas Eat Gum Leaves. He just cannot face eating one more gum leaf. Koala uses his binoculars to search for new bush tucker. 'Hello!' he spies an ice-cream through the lenses and his ice-cream adventure begins. The words and the illustrations make a wonderful combination where less is more. Laura's minimal use of words speak volumes especially when supported by the glorious, whimsical illustrations by Philip Bunting. Philip wrote and illustrated the story Mopoke but this time he has collaborated with wife Laura creating an funny and enchanting story. Laura and Philip express the koala's first taste of ice-cream in the most captivating way. They have the koala running, jumping, dancing and doing cartwheels showing his excitement of the sugar hit. He then begins to eat ice-cream for breakfast, lunch and dinner. Children know that while we would love to eat ice-cream for breakfast, lunch and dinner you cannot eat it for every meal because ice-cream is only a sometimes food. Too much ice-cream it can make you sick. Will the little koala in the story, Koalas Eat Gum Leaves, make this discovery too? Take a careful look at Philip's illustrations to find the picture where koala gets an ice-cream headache. You will probably be able to name many of the Australian ice-creams from the same page. Finally, endpaper lovers will adore the pattern of koalas eating gum leaves but on the back endpapers one is eating icecream.